"I recommend the Topline Range of Salts. This is a solar evaporated salt brand that contains huge amount of essential minerals like calcium and magnesium, as compared to vacuum evaporated salt brands." Sodium helps in proper functioning of nerve and muscles along with regulation of fluids in the body. Chloride ions maintain blood pressure and pH of the body fluids. Salt is one of the major ingredients in food. It is vital for sustaining life. Humans need salt for survival. It plays a vital role in nourishing human health too. It contains sodium and chloride ions that are imbibed in our body via salt. Apart from this, salt is also the major provider of iodine in our daily requirements. It is critically needed in pregnant women and for producing thyroid hormones. Hence, it is important that you choose a proper salt after much research and thought. They are supergood for your health. Calcium augments your bone health and helps absorb nutrients, while magnesium helps in protein synthesis. These power minerals keep you on the go always- physically and mentally. 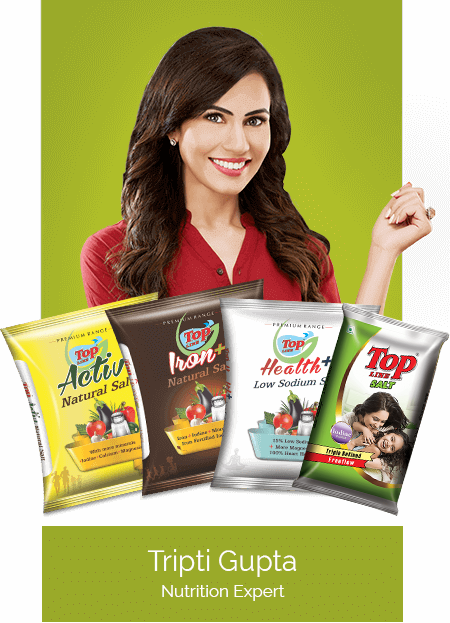 Topline’s wide range of salts- Natural, Activ, Iron Plus and Health Plus assist you in your hectic schedules, erratic lifestyles and provide you the energy to still smile at the end of the day! Adding Topline Salt to your food will make you a power house! Super Salts Pvt. Ltd. © 2019. All rights reserved.